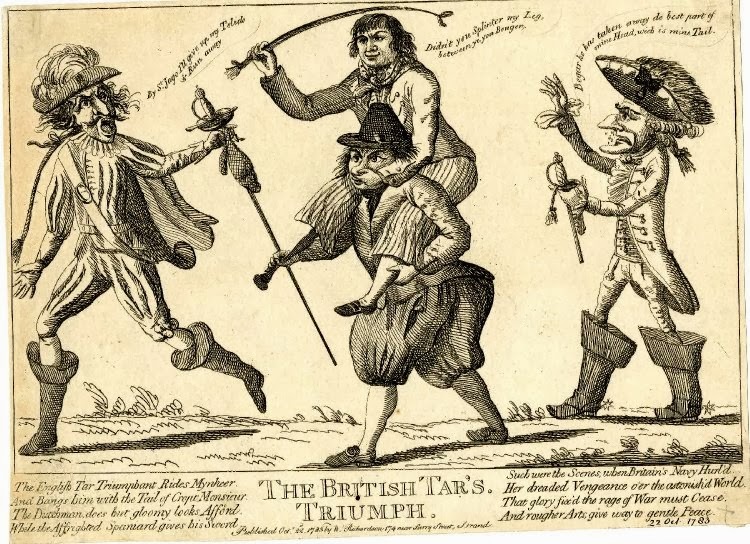 The British Tar's Triumph, Thomas Colley, 1783, British Museum. 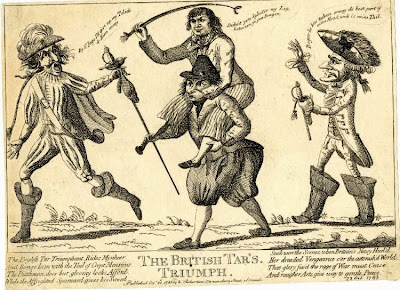 Riding the back of a Dutchman, our British tar swings a whip, riding crop, or perhaps a colt at a fleeing Spaniard, while being followed by a Frenchman bearing a broken sword. As far as political cartoons portraying British sailors of the American revolution go, it's pretty standard fare. The seaman has no hat, and wears his hair about shoulder length. His neckcloth is spotted and of a light color. Our sailor's jacket is double breasted with slash cuffs and no collar. Interestingly, his slops are striped! I've only found one other image of this in the nearly one hundred I've examined so far. It is a very uncommon depiction. Otherwise, the sailor wears the typical white stocking and round toe shoe with a rectangular buckle. EDIT: Adam Hodges-LeClaire points out that the object being whipped about by the tar is actually a queue! The long ponytail of hair that caricatures of the French were often depicted wearing has been torn off. You can see the ragged end of the queue hanging loose from the back of the Frenchman's head on the right.